Tell us how you feel about advancing to the Ro8 as first from your group. I feel so happy since this is my first Ro8 appearance in a while and even happier since I secured my Code S spot for next season. I am going to work hard so I can go all the way to the finals. It must have been a real shame for you to lose game two against HerO. I was in a really advantageous situation for game two. But I didn't have a lot of experiences against HerO hyung's style. Therefore, I made a lot of mistakes and ended up losing. You met Squirtle in the winners' match. You had the same hive army composition that you had for the first match. Game one was on Ohana but I knew that StarTale players don't scout and go straight to macroing after building their forge. So I prepared a build order to expose that particular weakness for game one. I didn't have confidence for game two on Cloud Kingdom however. I told myself to stay calm even if I ended up losing and I'm so glad I did because that decision allowed me to win the game. I focused heavily on my ZvPs. I spent a lot of time deciphering the styles of Squirtle hyung and HerO hyung and then my teammates would practice with me while mimicking those styles. Unfortunately, I didn't have a single Terran in our team who playes like Heart does so I just prepared for him through laddering. In today's matches, you showed a lot of plays consisting of hive armies. These days, Protosses are really good at microing and defending. It's really hard to win in the mid game using a roach/ling bust so I decided to go for the late games. With today's victory, you currently hold the most wins for a Zerg player in the GSL. How do you feel regarding that? I feel really good anytime I hear something like that. This is my first time knowing that I have played that many games. I feel really dazed. 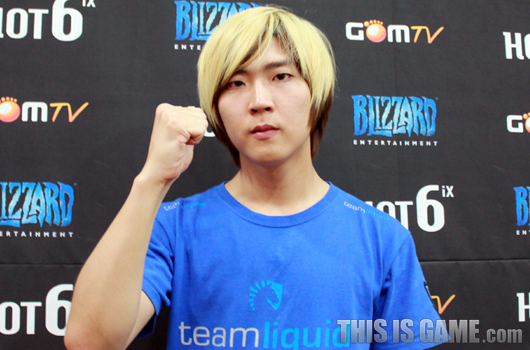 Your Ro8 opponent will be TaeJa. How do you think it will go? I thought my ZvTs these days were really bad. But then I just practiced up hard and realized it's actually fine. If I can prepare well, I'm sure I'll be able to win. Currently, the racial ratio that have made it to the Ro8 is three Zergs, three Terrans, and one Protoss. You must have a desire to win the championship right? Of course I desire to win the championship. But I really hope I can avoid mirror matches from here on out. If I just work hard and prepare well, I should be able to grab the championship. Recently, during mothership plays, a lot of Protosses have been demanding a nerf on the infestor's neural parasite ability. Honestly, it's a focus battle. If the Protoss' focus is good, he won't ever get his mothership stolen. Vortexes come out faster than we can neural parasite. So it's just a matter of how they use their vortexes. Have you tried out the HotS beta? Several days ago, I was able to try it out during a demonstration event. I didn't have a lot of time so i didn't get to play a lot but I was able to notice that our late game army compositions hadn't changed much. In my opinion, I think the Zerg's swarm hosts and Terran's widow mine are really good. For Protoss, I enjoyed freezing mineral lines with the oracle. Was today's ceremony a planned one? That ceremony was actually something I had been planning on using last week for the GSTL. But then the GOMTV official kept on asking me to do it today. While I was waiting for my matches, everything just fell right in to place (laughs). I want to thank the fans who cheer for me. We have a break because of ChooSuk coming up soon so I'm glad I was able to win like this before I go back to my hometown. I am so glad because I get to see my grandmother who I haven't met in a while. 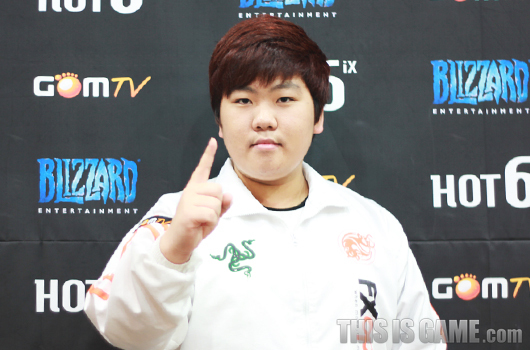 Lastly, I want to thank our sponsors RAZER, FXO, coach Choya, coach Choi, and coach Kwon. Tell us how you feel about winning the final match and difficultly advancing to the Ro8. Honestly, I felt some pressure from the fact that I would have to face Squirtle. I've lost to him before and I knew how good he was from his VODs. I really had no confidence because I figured I was going to lose, but I focused with everything I had so I think that's why I was able to win. Since this was a difficult victory, that's how happy I am. In the first match, you lost to Leenock by a score of 1-2. You did well with your warp prisms but why do you think you lost? Honestly, that wasn't what I had prepared at all. I had planned on doing a cannon rush for game one but then my build got all screwy and I ended up losing. For game two, I decided to try out macroing from two warp prisms. It wasn't easy but it worked well so I was able to win. In the final game on Antiga Shipyard, it's really hard to win against a player like Leenock on that map. Even if you can grab expansions, it's hard to kill the Zerg's army and it's also hard to bust through the Zerg's defense. In the losers' match, you easily defeated Heart by a score of 2-0. I didn't have a lot of time to practice so I focused mainly on my PvZs. I was feeling rather gloomy from my loss in match one but I had studied and dissected Heart's style from his VODs so I was still able to grab a victory there. In the final match, you powered your way through Squirtle. Were you feeling confident? In game one, I felt like my attacks weren't working so I was going to give up. But then I forced out an engagement and I ended up winning. In game two, I had the build order advantage from the start and my micro went well so I was able to grab the victory. You had to play against every race today. Wasn't that difficult? I'm not sure if I'm saying this because I won or not but personally, it was a lot of fun. I think my final match against Squirtle was the most fun. You've recently been showing a suffering form when it comes to PvZs so how do you plan on overcoming this? I used to have a lot of confidence in my PvZs. But the strategies Zergs do where they like to play defensive as they macro up to 200/200 with a infestor/brood lord composition is really hard to beat. I think I'm going to have to try out a lot of different things to be able to overcome that strategy. In the interview before yours, Leenock stated that the battle of vortex vs neural parasite is a focus battle. He's not wrong. It also depends on how much you focus. I think the most deciding factor though is to force the Zerg's attention elsewhere and then try to neutralize his infestors. In the Ro8, you will face By.Rain. How do you plan on preparing for him? I plan on preparing for him by practicing the basics. In order to understand his personality and his style I will not only practice PvPs but I also plan on deciphering other racial match ups. From my perspective, he is a really good player. I had a chance to face him during the WCS but I had to forfeit my match because of MLG. By.Rain also stated that he would like to face me during the group nominations so we'll have to face each other to see who will win. I think there is an equal amount of chance for one of us to beat the other. How high are your chances of winning the championship if you can make it to the Ro4? It's going to be difficult if I face a Zerg but I think I'll be fine if I face a Terran (laughs). I thought more Protosses would make it but only two advanced so it was a disappointment. Currently, fellow teammate TaeJa is also in the Ro8. If you both keep winning, there is a chance for you guys to meet each other in the finals. It doesn't necessarily have to be for a championship but I really want for that day to come. TaeJa is so good. It is true that I've lost to him many times, but now I even have fans saying that I am no match for him. But if you factor in our online tournament scores, it is pretty even (laughs). I think it will be a whole lot of fun if we get to face each other in the finals. I want to thank Jinro for coming with me to the studio today. I also want to thank the fans for coming to cheer for me today. I want to thank our sponsors TLAF, Twitch.tv, and RAZER. My father texted me words of encouragement while he cheered for me and that became a huge source of strength for me. I want to thank Sleep, Zenio, PuMa, TheStC, and Life for practicing with me. My recent Ro8 elimination from DreamHack had me feeling really down but then I received words of encouragement from my fans through twitter and community sites. Thanks to those words of encouragement, I was able to win today. I am truly grateful. Wait, really? More than Nestea and DRG? DRG started pretty late in GSL so I can understand, Nestea is a surprise though. Well, its in GSL, not only Code S, so Nestea only have 1 more season on him. Can't wait for the Hero interview. Good job, greatly appreciated! That definitely sounds confident. But i have hopes, Taeja! Lol for all the QQ about widow mine apparently leenock seems to like it. Thanks for these interviews seeker. Always nice to get to read what the korean pros are up to. Yeah, he just barely passed NesTea, and is 3-4 Match Wins ahead of DRG, but like 20 Set Wins ahead of him as well. "Unfortunately, I didn't have a single Terran in our team who played like Heart does so I just prepared for him through laddering. " Lol, somehow i found this particularly funny. Leenock fighting! Ah yeah stupid me. Leenock broke out in such dramatic fashion during MLG Providence/GSL November that I forgot he was a pretty decent player even in the old days. That's before Hero / Heart match, so actually 2. And Protoss been winning everything else so the zealot is quite happy.